Specifically designed to provide class-leading durability, all-season performance and ride comfort, the new SINCERA SN250 All-Season truly delivers. Using Falken's proprietary Dynamic Range Technology (DRT), the SN250 A/S ensures maximum grip at a wider range of operating temperatures for exceptional dry and wet traction. Strategically placed tread blocks balance harmonics to reduce tire noise for an impressively quiet ride. 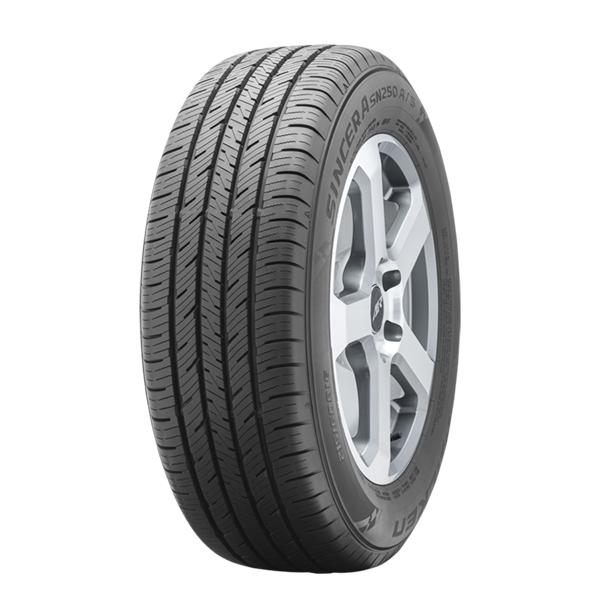 Featuring an 80,000/75,000 limited tread life warranty, 54 sizes and covering a massive 86%* of non-luxury sub-compact through full-size vehicles, the SN250 A/S meets and exceeds all critical touring tire expectations and more. *3D Canyon Sipe Technology-Increases edges for enhanced ice breaking and all-weather handling while the design's interlocking characteristics forma more solid tread block under load for excellent dry weather performance. *Symmetrical Rib Design-created to optimize even wear. *Angled Tread Grooves-on every tread rib add void for packed snow. *High Sipe Density-for enhanced all-season drivability. *Solid Center Rib-minimizes the effects of road wander caused by side defects. *Four Circumferential Grooves-evacuate water and enhance hydroplane resistance.